Breeding: -Thirteen pairs held territory in Ireland in 2015 (Fig. 1). At least nine pairs built nests and eight pairs laid eggs. For the first year since breeding began in 2012 more than one pair successfully fledged chicks: five pairs hatched chicks across four counties with four of these pairs fledging a single chick each (Table 1). Fig. 1 Growth in number of WTSE breeding and non-breeding pairs in RoI. One WTSE pair (CE01) nested successfully again in 2015 for the third year in succession fledging a single chick from a nest near Mountshannon, Co. Clare. Other pairs in Kerry (KY03 Killarney, KY04 Beara) and Galway (G03) successfully hatched and fledged chicks for the first time. Indeed pair KY04 became the first Irish nesting pair to fledge a chick on its first nesting attempt. A fifth pair (CO1) hatched two chicks but this breeding effort failed late on when the surviving chick was recovered dead in the nest. This chick was about 10 weeks old and potentially close to fledging. Examination of the chick on site and further post-mortem revealed a blockage in the crop and stomach apparently due to the chick swallowing feathers and bone. The nest itself contained abundant food items including several dogfish and thorn-backed ray. Two new pairings were documented in 2015 (C02, KY11) although the Co. Cork site had been occupied by a single apparently unpaired bird, presumably the C02 male, since 2013. 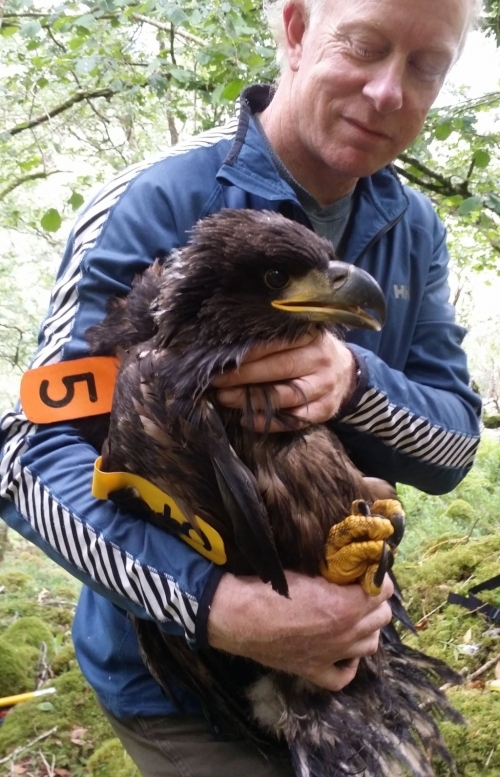 Interestingly the C02 female was previously paired and had nested in 2013 and 2014 in west Kerry but apparently abandoned the site after her mate was found dead in Sept 2014. A new ‘pairing’ (KY11) nested at the same site and indeed occupied the same nest in 2015 and observations suggest the resident female (red :) may have been driven out and the territory usurped by the KY11 females. Both these females had been largely resident in a nearby lough throughout 2014. The ‘pair’ male (blue 19) had spent the spring and summer of 2014 on the west Kerry coast and had been previously recorded with a 2011 female (black •1) feeding at salmon cages near an offshore island. A second trio (KY09) also nested for the second year in succession in south Kerry. Both trios laid eggs but neither failed to progress beyond the early stages of incubation. In the latter case the nesting attempt apparently failed following a “squabble” between the two males, presumably resulting in the birds breaking the egg/s. As discussed in the 2014 report, trios are rare but not unprecedented in small populations where there are few or no alternative mates or breeding opportunities. Neither ‘pairing’ has shown any definite signs of break-up and indeed the KY11 trio looks set to renest at the same site in 2016. Whether interaction between the KY09 males results in this trio breaking up in 2016 remains to be seen. As well as the loss of the KY08 pairing, at least two other pairs have now broken up, in all cases likely due to adult mortality: G01 and KY07. Sadly the G01 female was on the point of egg-laying when she was recovered dead on the nest in early April 2015. The pair male, satellite tagged Star, subsequently abandoned the territory and dispersed widely around Ireland although returning to the nest area some months later. As of Oct 2015 Star appears to be resident on a freshwater lake in the north-west of Ireland. Another pair has not seen on site since early 2014. There was no breeding evidence for three other pairs (KY02, KY06, and G02) and it remains to be confirmed whether all these pairs are intact. The expansion of the breeding population to counties Cork and Galway as well as Kerry and Clare is encouraging with at least eight pairs laying eggs and four fledging chicks. However, as we have seen with the loss of adults of breeding age in 2015, losses of adult/sub-adult birds from these pairs can slow or even halt reestablishment of a viable breeding population through pair break-up and individuals remaining unpaired/non-breeding for several years due to lack of suitable mates and/or breeding opportunities. Thus, minimizing losses, especially of adult and sub-adult WTSEs will be critical to reestablishment as well as maintaining and increasing the current breeding population.